In Wisconsin’s fourth largest city on the Lake Michigan shore lives a man with immense musical talent. A native of Kenosha, Wisconsin, Jamey Buencamino lives through his philosophy that music is art, that is, it allows individuals to express themselves in profound ways. “It’s up to the musician to create a unique personal sound,” Buencamino says. Along with teaching, he has lived a life filled performances in both classical and rock guitar. He lives and breathes guitar; it’s a life journey that began when a Filipino met a woman from Kansas. In music, his favorite memory is playing guitar in rock bands in high school. “It was an excellent experience, and I had fun creating original music with other musicians,” he elaborates. From a young age, Buencamino has been immersed in the world of music. He started piano lessons when he was 7. This lasted until he was 13 when he became more interested in the guitar. He became enamored with the instrument, taking private guitar lessons from 13 until he was 18 before attending the Berklee School of Music in Boston for three semesters after high school. He eventually earned his undergraduate degree in music, concentrating in classical guitar performance, from the UW-Parkside in Kenosha Wisconsin. Also, he received a master’s degree in music with a concentration in classical-guitar performance from Northwestern University in Evanston, Illinois. He credits his educational experiences, as well as the countless performances he was part of, with molding the guitarist he is today. Buencamino credits Anne Waller, who was his classical-guitar professor at Northwestern University, with helping him improve his classical-guitar techniques and encouraging him to excel. 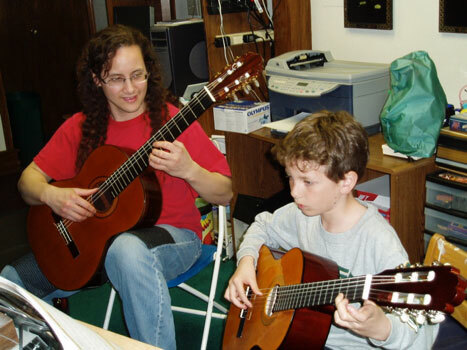 Also, she taught him the history of the guitar and shared strategies in guitar instruction. Today, Buencamino primarily performs classical guitar. However, he has occasional rock guitar gigs and still writes and records music in that style. He teaches all ages and levels from beginners to advanced students at the Kenosha Conservatory of Music. Also, he teaches classical guitar at the UW-Parkside. Buencamino offers a few words of advice for future guitarists. The biggest lesson he has learned is to keep an open mind and always accept constructive criticism whether you agree or disagree. “There are times when I disagreed with a person’s criticism,” he observes, “but months or even years later, I started to see their perspectives and consequently agreed with them.” Buencamino also talks about the importance of practicing, working hard, being patient, having fun and being creative. Filipinos are renowned worldwide for being great musicians. Jamey Buencamino is a living example of musical excellence, and he has used the guitar to touch the lives of his students, audiences and other musicians. “I get to express a more formal and intimate side of me performing the classical-guitar style and the aggressive and energetic side of playing the rock-guitar style.” Keep on strumming! Christian Gabriel Pareja writes from Glenview, Illinois, where he was the Youth of the Year in 2017. A Butler University student, he is proud of his Philippine heritage and enjoys community work.